This is the 3rd in our series of "Best Regions to Retire". Go to Tips & Picks and look under "Regions" category for more articles in this series. New Mexico is a delightful, but often overlooked best place to retire. One reason for that might be that there are not that many recognizable towns in what is really quite a large state (it's the 6th most sparsely populated state). Another might be that it tends to be eclipsed by its higher profile neighbors - Utah, Colorado, and Arizona. New Mexico had just under 2,000,000 residents in 2008, making it the 36th most populous state. It has a large native American population. Its climate, tax structure, relative low expense (in some places), and geography make it a particularly appealing place to retire. Albuquerque is by far the dominant city in the State with its population of over 500,000. 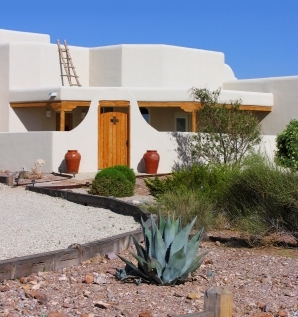 According to Zillow the median list price of a home in the State was $230,000 at the end of 2009, with prices much higher than that in Santa Fe. Prices have been very stable, particularly compared to neighboring states. New Mexico has a property tax reform that does not permit those taxes to go up more than 3% per year. Use this link for complete information about taxes and all aspects of New Mexico retirement. Santa Fe is one of the most affluent towns in America as well as being one of its arts and culture capitals. The home of Georgia O'Keefe, Santa Fe attracts artists, art lovers, and opera fans to its world class facilities in droves. Not to mention people who like living in these beautiful mountains at an altitude of 7,200'. Ruidoso is an alpine like resort set in the mountains to the north of Las Cruces. Many people, including a lot of Texans, are attracted to Ruidoso because of its nearby Ski Apache Ski Resort, its casino, and quarter horse racing at Ruidoso Downs. Some of the other places to consider for a New Mexico retirement include Alamogordo (near Ruidoso), Carlsbad, Clovis, and Farmington. You can look these up on Wikipedia.com or City-Data.com to get more details on these towns. New Mexico is a bit under-appreciated as a retirement destination. True it doesn't have the variety of places to retire that Florida or Colorado have. But it does have a unique climate thanks to its high elevation at a southern latitude, property tax reform, and several really interesting places to retire.